The best little town in Panama? We have had a 6.8 earthquake, horrendous floods, hurricane winds and yet the great people of this little town just keep on ticking. The potholes on the main highway have been filled, some of the garbage pick-up is functioning like a Swiss watch and If you drive around Volcan today you can see construction taking place all around you. A few miles away even more work is being carried on at various hydro-electric sites. The new and improved police force is getting praise even from the foreigners. Are we finally emerging from the shadow of our sister town Boquete? 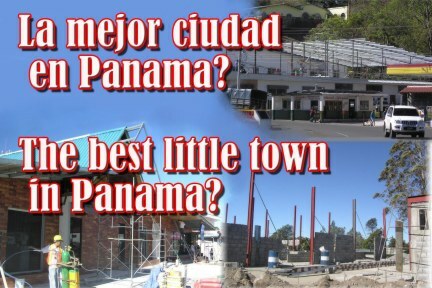 Can we become the best little town in Panama? The answer appears to be: yes we can! La mejor ciudad en Panamá? Hemos tenido un terremoto de 6,8, horribles inundaciones, vientos huracanados y, sin embargo, el gran pueblo de esta pequeña ciudad a seguir marcando. Los baches en la carretera principal que se hayan cubierto, algunas de las basuras pick-up está funcionando como un reloj suizo y si la unidad en torno a volcán hoy se puede ver la construcción que tienen lugar todos los que le rodean. A pocos kilómetros de distancia aún más el trabajo se está llevando a distintos sobre hidroeléctrica sitios. La nueva fuerza de policía y la mejora de elogios está recibiendo, incluso de los extranjeros. Åre finalmente salen de la sombra de nuestra hermana ciudad de Boquete? ¿Podemos ser la mejor ciudad de Panamá? La respuesta parece ser: sí podemos! Close to the Police detective unit, in the center of Volcan is a small building that houses the once monthly spay/neuter clinic. The facility is the brainchild of 67 year old American, Dottie Atwater. 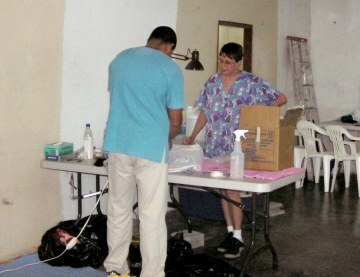 The clinic has helped 795 cats and dogs by preventing unwanted pregnancies. Formed in 2001, Spay Panama, is a nonprofit organization, so affordable spay/neuter facilities would be available throughout Panama for anyone of low-income and for people who feed and care for homeless animals. On this bright winter’s day 29 animals had been processed. As I arrived the last cat was slowly recovering from the anesthetic. A bit too slow for attending vet. Dr. Andreas Tello. The good doctor was giving glucose to aid the cats recovery. Slowly the slender black feline’s eyes rolled and then she licked her lips. Finally the doctor was happy and the animal was delivered back to its owner. 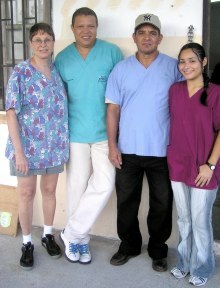 Dottie and her small crew: Argelis Gomez, and Jose Espinoza and a small army of ex-pat volunteers help in the monthly clinic. The animals are weighed, tagged and examined for venereal disease. After the procedure they are given a pain killer, anti-inflammatory and when necessary treatment for ticks and fleas. The clinics are working as there have been no cases of venereal tumors in the last 3 clinics. For Dottie Atwater this is a labor of love. Often the donations don’t match the costs of the clinic and the vet and she has to make up the difference from her own pocket. The rewards can be seen in her tired but immensely satisfied face. “This I do from the heart.” She told me. The fact that she has ten dogs in her own home testifies clearly to the size of this remarkable woman’s heart. Soon the only dogs on the streets of Volcan will belong to families that feed them, care for them and importantly, love their animals. As the sun’s glow warmed the slopes on the nearby Volcano, two small dogs sidled up to the door. One, obviously emaciated shyly ran away from the offer of some sandwiches. The second small brown dog, with a clearly infected eye, viewed the food on the ground suspiciously. Dottie smiled at these future customers. “Ok guys, take a number for next time.” Sadly, there will always be a next time. Part of Dottie’s work is to educate people on the proper care and feeding of animals. 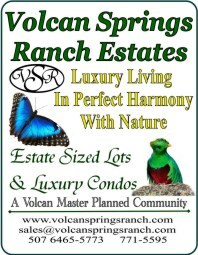 Eventually all the creatures great and small of Volcan will get a happier and healthy life. 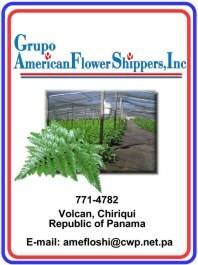 Is it the rarified mountain air or the eternal spring climate that helps our Chiriqui artists to produce such classic – what I might describe as world quality - art? 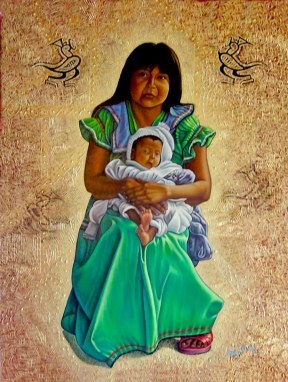 Case in Point is Rio Sereno artist, José Pitti Del Cid. 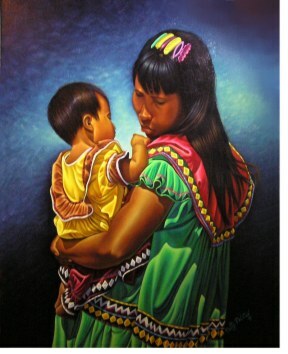 This 41 year old painter has studied in Costa Rica, Panama City and here in the city of David. His eighteen years in his craft has enabled him to paint pictures with the same brilliance and detail as his inspiration: the Spanish painter Diego Velázquez. (1599) Velázquez was the inspiration for the realist and impressionistic artists such as Manet, Pablo Picasso and Salvador Dali. Jose Pitti’s work has the same vibrant colours as his famous predecessors but his amazing attention to detail is closer to the work of Michaelangelo and Leonardo Da Vinci. 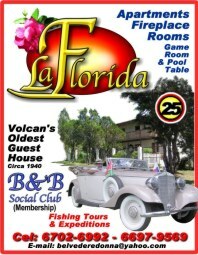 In Volcan, lamentably, there is only one outlet for local artists and that is in the Cerro Brujo Gourmet Restaurant. Jose Pitti has three works currently on display, two featuring Ngobe women ina classic maddona pose and one brightly coloured abstract. The painting that really caught my eye was something that at first glance looks like a Russian Religious Icon. The background is a gold leaf effect onto which Pitti has painted a young Ngobe woman holding her baby. Two things stand out. The skin texture is so realistic you imagine you are looking at a photograph. The texture of the dress is almost silken-like and the final touch is the lighting. If you have ever looked closely at any of the great masters they made great use of light to emphasize the subject matter – José Pitti has definitely mastered the technique of highlghting. His work can be seen on walls throughout the US, Panama and as far way as Lebanon. He uses a technique called “grisalla.” He explained that first he draws an outline in black and white and then adds the colours one at a time. The process is painstaking – fifteen days is the average time taken to complete a painting. HOW WOULD YOU LIKE TO BUILD A RAILWAY? The chamber of commerce and the soon to be formed “Railway Group” are looking for volunteers. 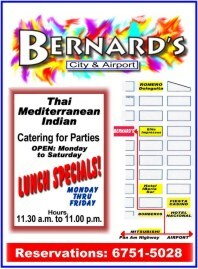 The project in simple terms is this. In Bugaba railroad station there are two railway cars that used to run between David and Puerto Armuelles. 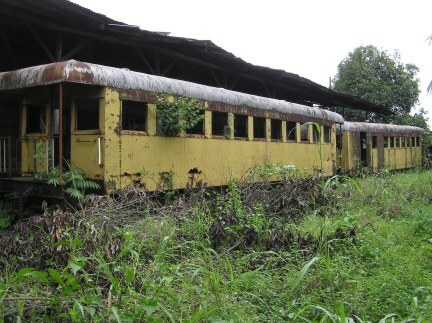 They are an important part of Chiriqui history –in fact Albert Einstein may have ridden aboard these very coaches. They are rusting away and so is a part of Panama’s history. The local chamber of commerce has purchased the coaches and all we need is a group of determined volunteers to help move them to the front of the new artisans market and then to refurbish them. The refurbished coaches can have a variety of uses: they can be the town’s “TOURIST BUREAU.” Here all local businesses can have their pamphlets and advertising brochures on display. It could operate as a kindergarten or a meeting place, a yoga exercise center, a museum . . . The possibilities are endless. We have a rather wild idea to put Volcan on the world map. We hope to have the coaches able to move a short distance around a curve and thereby we could have “The World's Shortest Railway Journey.” Sure it's a gimmick but our little town needs a boost in its tourism many stores and restaurants rely on that. SKILLS REQUIRED. We need carpenters and people experienced in metalwork. Yes we will need some donations but the main thing we require is hard work and sweat and lots of volunteers. 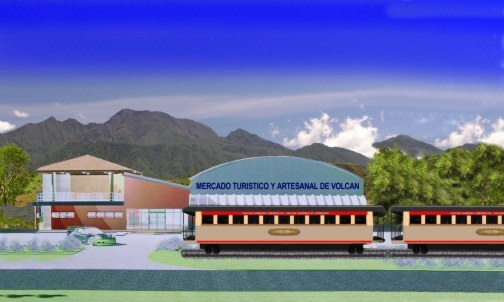 It is our goal to make Volcan “The best little town in Panama.” We have survived earthquakes, devastating floods and horrendous hurricanes, surely building a little railway shouldn't be impossible.